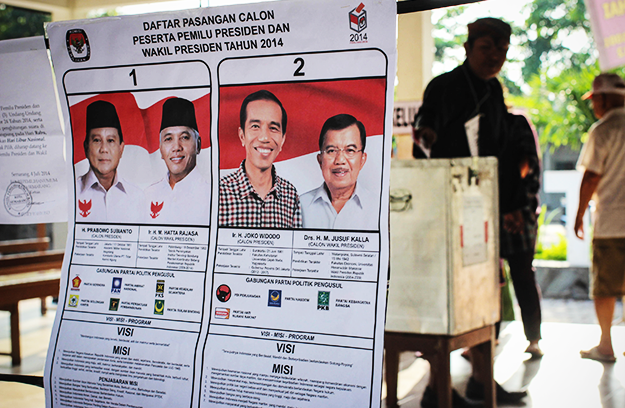 On July 9th some 140 million Indonesians went to the polls to vote for a new President. It was only the country’s third direct presidential election, and certainly the closest, with two very different candidates. Each declared victory based on competing exit polls but at the urging of the outgoing president agreed to await the official results, to be announced on July 22nd. You might not know any of this if you rely on US media. I find it astonishing how little attention the Indonesian election is getting here in the United States—the print edition of the Washington Post did not have a single story about the initial election results on July 10th. Yet the next president of Indonesia will have a significant influence not only on the fate of the world’s fourth most populous nation and largest majority Muslim nation but also on the well-being of rest of us through Indonesia’s role in addressing a host of global challenges. Take forests and climate change. An article in the journal Nature Climate Change this month presents new analysis showing that from 2000 to 2012 Indonesia lost more than six million hectares of natural forest, overtaking the rate of forest loss in Brazil. This deforestation translates into a globally significant contribution to the greenhouse gas emissions that cause climate change. The outgoing President, Susilo Bambang Yudhoyono, took several steps to address this challenge. In 2009, he was the first developing country head of state to announce voluntary emission reduction targets. In 2010, he signed a Letter of Intent (LOI) with the Government of Norway to reduce emissions from deforestation and forest degradation (REDD+) in exchange for up to a billion dollars in performance-based finance. Consistent with the terms of the LOI, the President has imposed (and extended) a moratorium on new forest exploitation licenses, initiated a process of increased transparency of forest-related information, and established a new agency to oversee the REDD+ agenda (CGD recently hosted an update on the agency’s progress with the agency head Heru Prasetyo). Precisely because these initiatives were undertaken by presidential decree, they are vulnerable to being reversed by whoever succeeds Yudhoyono in October. Neither candidate has made explicit commitments about what he would do on the REDD+ agenda per se. Both have promised to promote reforestation—tree-planting was also a favorite of President Yudhoyono—although protecting existing forests from destruction and degradation is more important than planting trees for protecting biodiversity and controlling climate emissions. But while the new president could choose to undo the specific policies or institutional arrangements put into place by his predecessor, he will not be able to avoid confronting the issues of forests and climate change, or the growing domestic and international constituencies pressing for effective action. The millions of Indonesians who are affected by the consequences of forest destruction, including increased incidence of forest fires, landslides, and flooding. Near neighbors, especially Singapore, that are affected by the haze from Indonesia’s forest fires. Indeed, forest fires might well be a front-burner issue as the new president takes office three months from now. “El Nino” years, when Pacific Ocean waters are unusually warm, have historically been associated with bad years for forest fires in Indonesia and haze across the region. NOAA’s climate prediction center currently pegs the chances of an El Nino event at close to 80% for later this year. Whether or not fires are especially bad when the new president takes over, he will need the support and encouragement of the international community to tackle the difficult challenges of stopping Indonesia’s deforestation. I hope that the US news media and the rest of the international community will be paying more attention when he takes office than we appear to be doing now.